Perth, Australia—At the Australasian Oil and Gas Exhibition and Conference (AOG), Blackline Safety Corp. (“Blackline”) (TSX Venture: BLN), a leading manufacturer of lone worker safety monitoring solutions launches the Loner Bridge System for use throughout Australia and New Zealand. From the Australian Outback to Southern Lakes of New Zealand, employers can now easily and comprehensively monitor the safety of their personnel working alone—under extreme conditions—and in remote locations. In its 35th year of operation, AOG brings together over 500 exhibiting companies from 25 nations that present the latest innovations to nearly 10,000 energy industry professionals. Blackline is demonstrating it’s work alone solutions— including the Loner Bridge System, standalone cellular-connected devices and its lone worker app for iPhone, Android and BlackBerry—at stand S32 in the health and safety pavilion of the Perth Convention Exhibition Center. Blackline’s Loner Bridge System is a two-part solution that was designed from the ground up to meet the most demanding customer requirements for monitoring the safety of their employees. The Loner Bridge portable satellite and cellular base station manages all communications to the Blackline Safety monitoring network. An industrial-quality radio link connects up to 10 Loner 900 person-worn safety monitoring devices, delivering a real-world range of two kilometers from the Loner Bridge base station. The radio link quality enables personnel to be monitored within complex facilities. 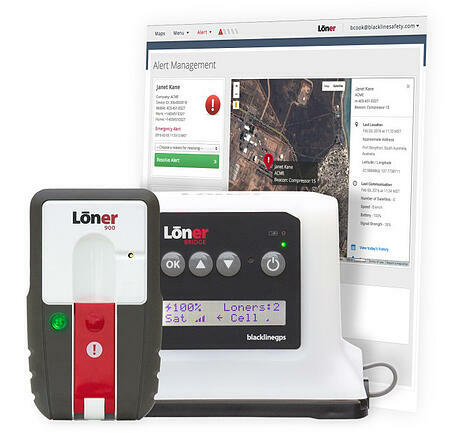 The Loner Bridge System helps work crews to self-rescue with a TeamAlertTM that triggers a muster alarm on teammate’s Loner 900 devices when an employee needs help. Loner 900 automatically detects falls, man- down situations and missed employee check-ins. The employee can call for help by pulling an emergency latch, much like a fire alarm lever. Unlike an SOS or panic button, the Loner 900 emergency latch can be triggered with confidence even if the worker’s vision is obscured. Loner 900 makes use of GPS and is used for precise outdoor positioning while Blackline’s Loner Beacon product enables employees to be located throughout plants and buildings with precision. Blackline's broad Loner® safety monitoring portfolio empowers organizations in all industries and geographic locations with real-time safety incident awareness, delivering help within minutes instead of hours or potentially days later. To learn more about Blackline's work alone devices and lone worker app, visit www.BlacklineSafety.com and follow Blackline on Twitter @blacklinesafety. About Blackline: Blackline Safety Corp. (TSX.V: BLN) is a wireless location leader that develops, manufactures and markets products and services for lone worker safety monitoring. Targeting every industry, employee role and location, our Loner® solutions are promoted through offices in Calgary and the United Kingdom and sold through a growing network of international distributors. Loner products alert monitoring personnel of a safety incident, locate the worker and empower the most efficient emergency response—Alert. Locate. Respond.TM Our vision is to become the leading supplier of wirelessly connected lone worker safety monitoring products in the world. For more information, visit www.BlacklineSafety.com.